Hi all! So sorry I have been out of touch for awhile, it’s been nuts around here. Summer is so fun, and we’ve been having fun and taking a little time just to hang out and play. But, there is still some stuff being done. The pool remodel is finally starting to come along. It seems like it’s taking forever. We were hoping to be swimming by the time school was out, but here it is a month later and we are still waiting. 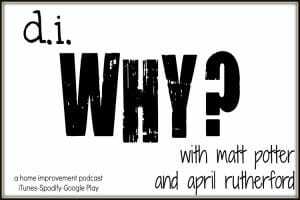 To see where we started, check it out HERE. 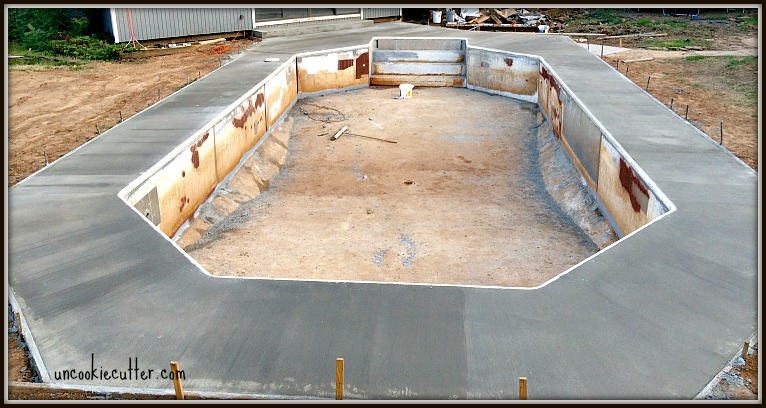 But, finally yesterday the concrete was poured! Yay! Can you start to see it? I’m getting excited :). 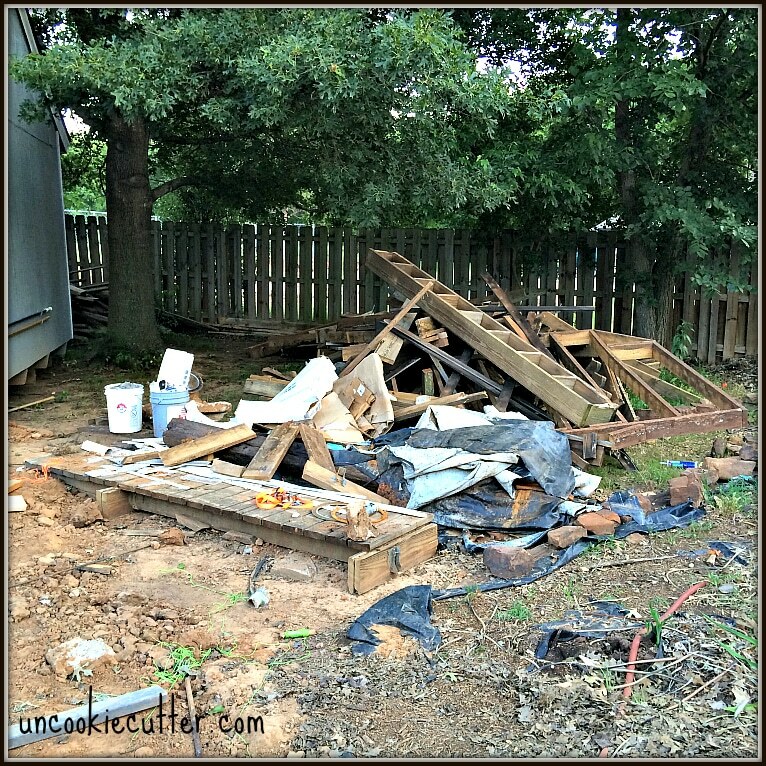 Part of the reason it has been so hard for me to get stuff done is because the back yard is an absolute mess. I feel like the beverly hillbillies. 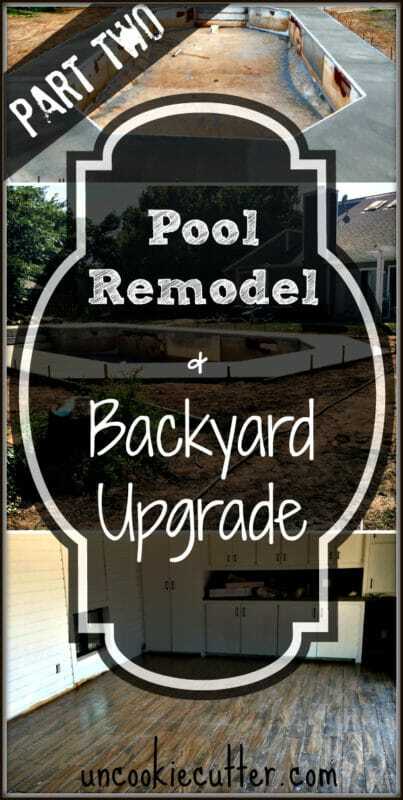 But, since the pool remodel is, “fingers crossed”, on the home stretch, the dumpster has been ordered. I can’t wait to start throwing stuff in. The whole deck is probably going to go. I will try to salvage some of the wood, but most of it is in really bad shape and is just inviting snakes and other critters to nest in. Plus, all the stuff we pulled out of the office is unusable, so until the dump gets here, it’s just sitting here :). 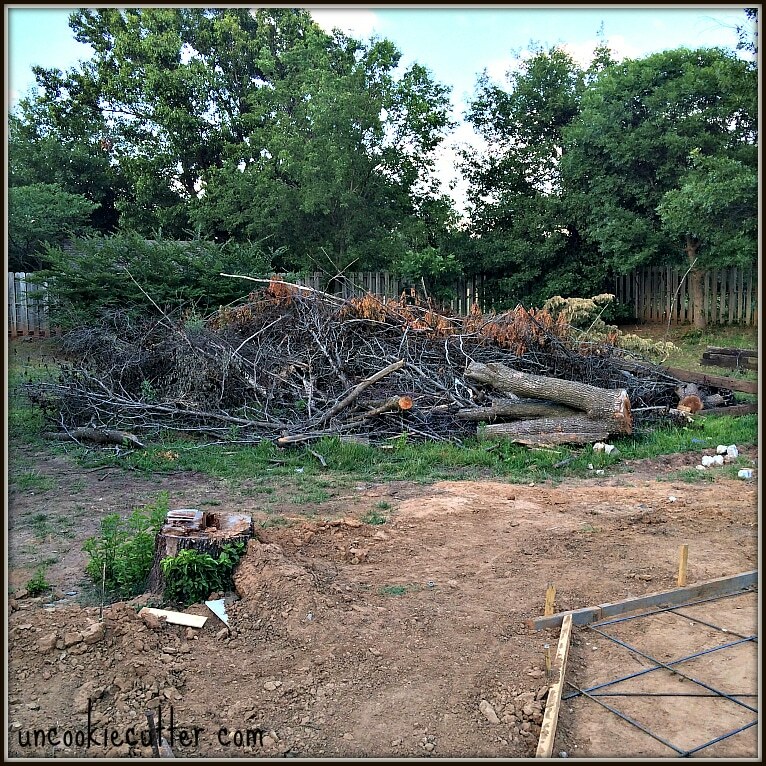 If you remember, we had to take the two beautiful Bradford pears down. It made me so sad, but it had to be done for a number of reasons, including the fact that they were breaking off and I was afraid they were going to fall on a kid. My husband is renting a wood chipper to turn these trees into usable mulch. 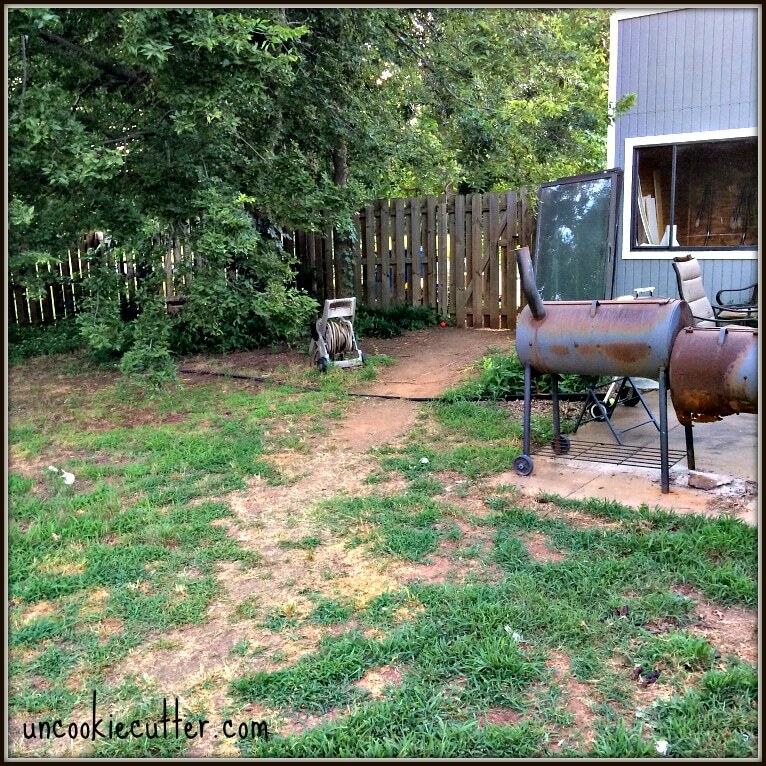 After this, HOPEFULLY we will have a functioning yard to play and hang out in. In addition to the pool remodel, my husbands pool house/office is also coming along, but very slowly. There are days I can’t get in at all because of the pool, and my garage is filled with all the stuff from around the house that will be put into the dumpster as well as the pool guys equipment, rendering it a total mess and also unusable for now. So, the renovation has been slow going, but we are actually moving along! I can’t wait to start decorating it! 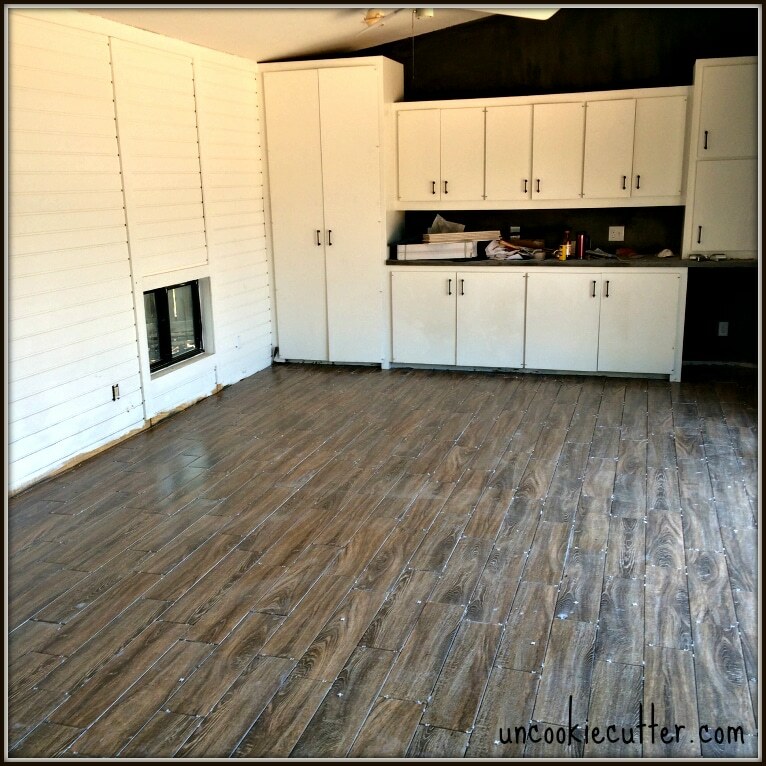 I’ll be finishing the grout on the floors just as soon as I finish writing this post! I’ll have a full post on my first experience with tile, coming soon! You can check out where we started HERE. 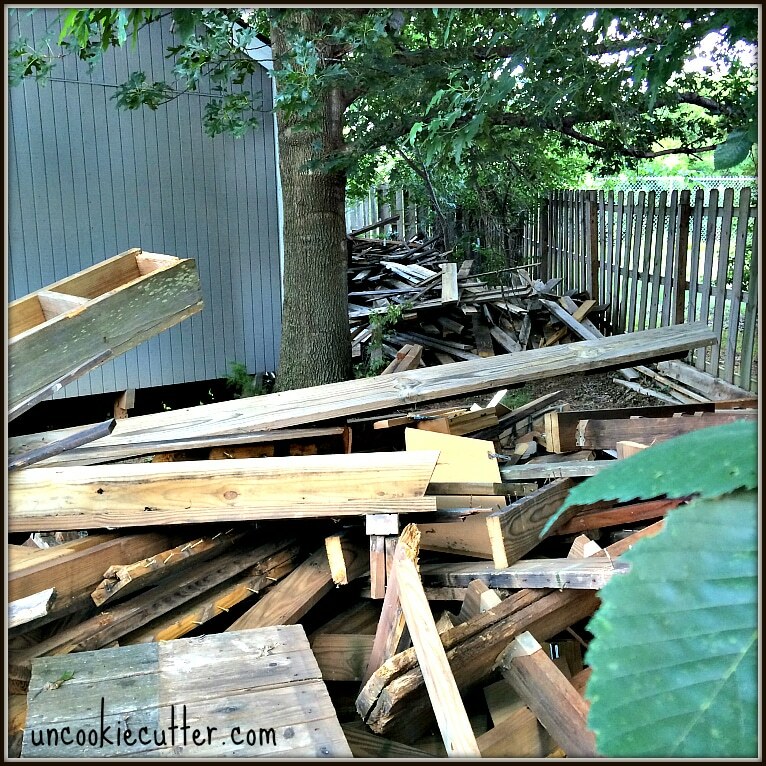 Does anyone else have a hard time getting stuff done when there is such a horrible mess? 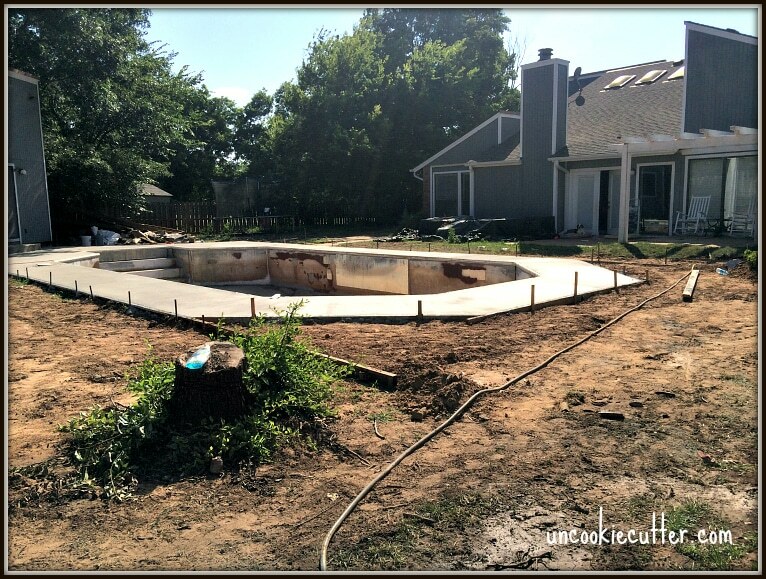 I can’t wait to get it cleaned up and get this pool remodel done! So, that’s where we are now. Thanks for following along! Absolutely yes, I have so much trouble getting things done when there’s a mess. Hopefully the dumpster will take care of that for you, and you’ll have a POOL soon enough! It’s all done, finally! But you have reminded me I need to update this post to reflect that :). Thanks for stopping by! Can’t wait to see the completion! 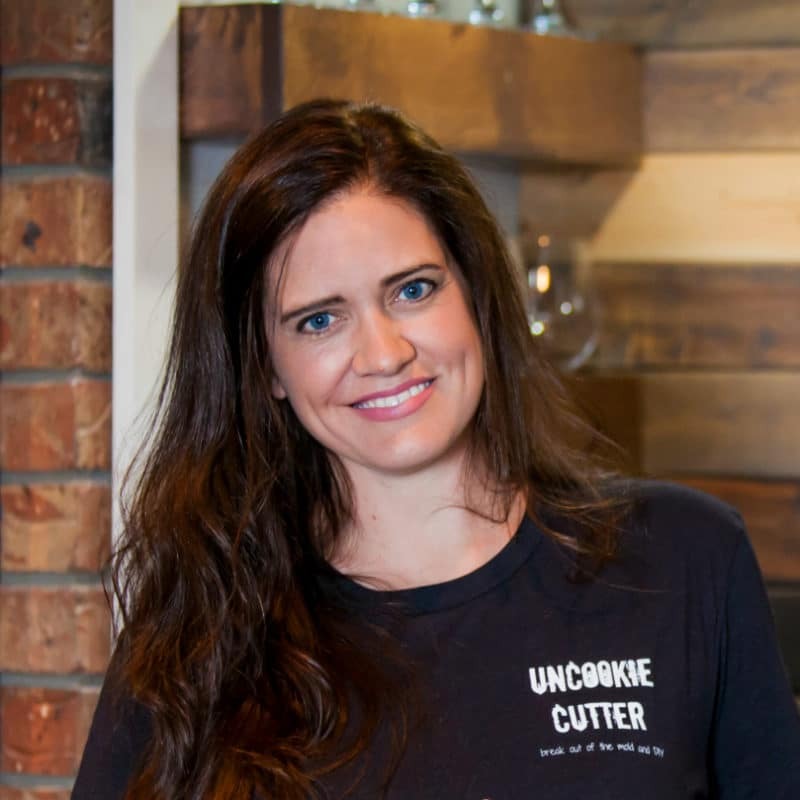 Hi Anita – you can check out the office reveal here -https://www.uncookiecutter.com/home-office-reveal/ . Thanks for stopping by!